Recently, documents have been uncovered that have provided evidence that during the Civil War, Union paleontologists found a lost valley in Virginia where dinosaurs still survived 65.5 million years after the last one died. In a typical move, the Federal Government took over the project and had the Union Army attempt to train the dinosaurs to fight against the South. 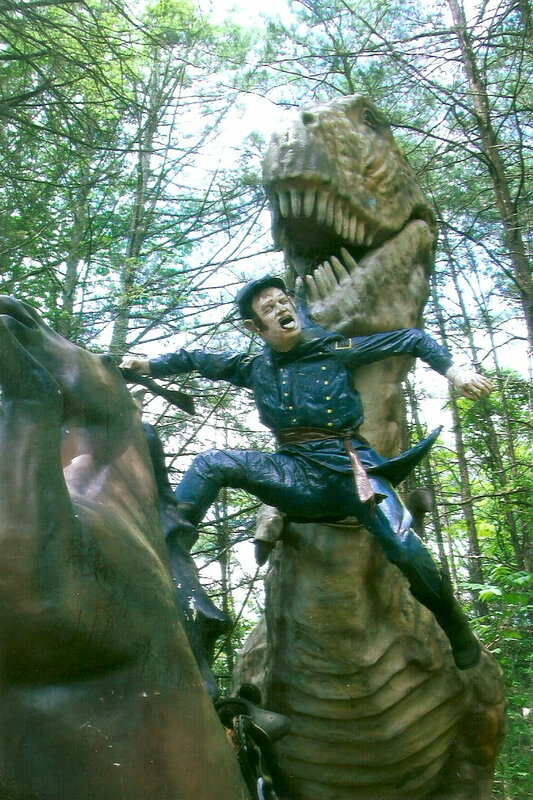 The dinosaurs rebelled, killed the Union soldiers and helped the South win the war. Seriously. OK, maybe not. Nothing in the above paragraph is factual, including the death of the dinosaurs, since from a taxonomic point of view, modern birds are a surviving clade of dinosaurs. It’s all in an alternative history “theme park” in Virginia called Dinosaur Kingdom. It’s not a creationist theme park like the Creation Museum, which is an evolution-denialist amusement park that has humans living amongst dinosaurs. I think there’s a metaphor here. The slave-owning South needed simple minded dinosaurs to help them.